Throughout India's long history, monarchs and wealthy merchants have given gold, pearls and gems to temples to honor the deities and gain religious merit. 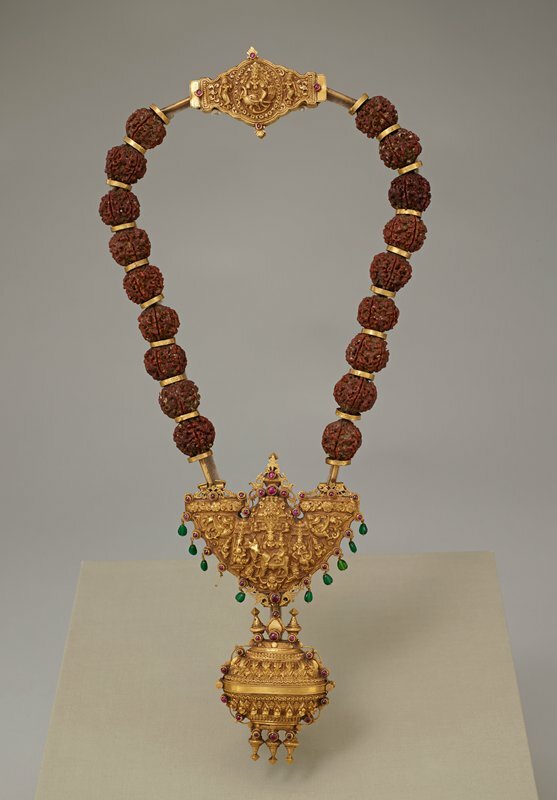 Temple treasures include extensive jewelry holdings and, on ceremonial occasions, Hindu priests and ascetics wore the valuable ornaments in rituals. The pendant is suspended from a garland of twin rudraksha berries which symbolize the union of Shiva and his consort Gauri. The sacred couple is depicted riding the bull, Nandin, in the central gold piece of the necklace. L.17-1/2 x W.(at widest point in pendant)4-3/8 x D.1-5/8 in.